Even with all your processes and technology in place, phishing attacks containing ransomware and other malware continue to penetrate your defenses. 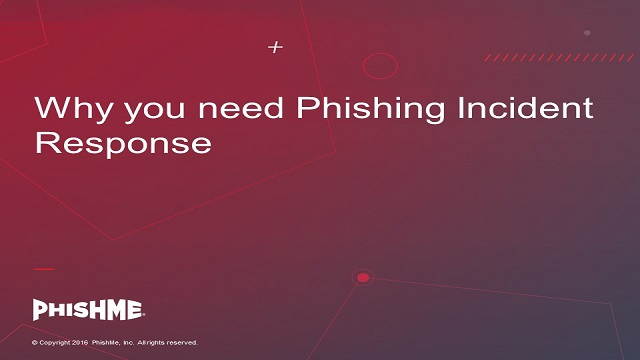 With 91% of all attacks on enterprise networks being the result of successful phishing attempts, organizations need an efficient and effective phishing incident response plan. PhishMe Triage enables SOC and IR teams to quickly process and analyze real phishing threats to their organizations. PhishMe Triage customers have been able to quickly find and remediate attacks in progress and improve phishing threat analysis efficiency from hours to mere minutes. PhishMe Triage also frees up the manual resources previously needed to process the thousands of malicious emails reported by employees. It’s a constant game of cat and mouse. Security teams shift tactics to stop the latest phishing techniques, and boom! Threat actors respond with another ingenious wrinkle. With phishing now the #1 cyber-security problem (according to Microsoft’s latest Security Intelligence Report), it’s imperative to keep up. Over 90% of breaches begin as phishing emails or other social engineering tactics. Don’t wait for the next attack. Register now! Would you like to schedule a year’s worth of simulations in just a few clicks? And deliver phishing simulations without the hassle of whitelisting? The brand-new features in Cofense PhishMe™ allow you to do just that. With more than 90% of breaches attributed to successful phishing campaigns – now is the time to elevate your phishing defense program to prepare for and prevent attacks. New year. New resolutions. Every year we make the pledge to eat healthier and get more exercise. What is good for the waistline is also good for your phishing defense posture. With more than 90% of breaches attributed to successful phishing campaigns – now is the time to think about how to prepare and prevent attacks. In this session, you’ll hear about 10 resolutions for your phishing defense programs that will make your organization more secure. Bad News: Over a third of all phishing attacks target financial institutions. Good News: Recent Cofense research shows that when financial companies train employees they will report phishing. In fact, a Cofense customer recently stopped an attack in 10 minutes. But how do you know if your organization is ready for an attack? Does your company have the right tools to quickly block threats that evade perimeter defenses? We hear horror stories about users clicking on some malware-enabled payload and all of a sudden all of the codes for their hardware security fobs are stolen or a business email compromise (CEO fraud) attack has been launched. Unfortunately, these stories are true. Phishing and its cousins, spear phishing, vishing, smishing, pharming, and whaling are all serious security concerns, but are they cyber-Armageddon? This 20/20 editorial webcast with ensuing special report focuses on the realities of phishing and recommends defenses you can use to reduce your risk and make it a less profitable business for the attackers. When a phishing email makes it past your next-gen perimeter defenses - and it will - what do you do next? One way is through automation, letting the latest blinky boxes take care of the threat, but are they always right? The best response is a blend of documented, repeatable procedures that includes human intuition, along with automation. Technology alone is not enough to respond to phishing attacks. In this session, Aaron Higbee, CTO and co-founder of Cofense (formerly PhishMe) will discuss best practices on blending human intuition with automation. Tonia Dudley, Security Solution Adviser, will demonstrate how to stop phishing attacks faster with Cofense Triage. A third of all breaches target healthcare companies. But while phishing defense is an industry must, new Cofense research shows that healthcare lags behind other sectors in recognizing and reporting phishing. If you're in healthcare, or any other industry for that matter, how do you know if your organization is ready for an attack? What’s keeping you up at night? Ransomware? Phishing? Spyware? Malware? Data Breaches? A malicious email typically opens the door to those threats. Organisations spend great energy (and budget) preventing users from falling prey, but threat actors continue to find ways to get past automated controls, staying one step ahead of artificial intelligence tools. Solving the phishing problem is more than just awareness: it’s about empowering humans to become instinctual nodes on the cyber defence network and feeding their real-time intelligence to security teams for immediate action. Join Cofense and (ISC)² on Oct 10, 2018 (Wed) at 13:00 (Singapore time) to hear about trends that we’ve been seeing around the globe and how they can impact the Asia-Pacific region. A major breach of your enterprise's critical data could potentially threaten the life of your business. In addition to the potential loss of customer data or intellectual property, a breached company faces public scrutiny, IT security overhauls, potential lawsuits, brand damage, and loss of customers. In this webcast, experts discuss the real losses associated with a breach, both in the data center and in the business –and how an effective data breach response program can help mitigate the damage. While ransomware might not be dominating the headlines, it is still a persistent threat that continues to evolve. Weaponized emails still make it past the gateway and ransomware infections happen. Today, variants of ransomware offer “customer support” offered by the cybercriminal for communication and negotiation with the victim. Ransom amounts can vary depending on the perceived wealth of the victim. Ransomware operators also offer flexible payment methods using forms of payment other than Bitcoin and even structured payment/decryption plans. As ransomware evolves, so must your response to these threats. Ransomware is a vicious type of malware. Not only can it potentially destroy your data and perhaps even your hardware, it can wreak havoc on your business operations. Ultimately the question a company has to face, of course, is do you pay the ransom for the chance to recover your system or not. If you don’t pay, you potentially could lose everything. If you do pay, you potentially could still lose everything, as well as possibly break various laws. This 20/20 editorial webcast with ensuing special report takes a deeper dive into your options and why you might well face a no-win scenario. It’s the Kobayashi Maru test – do you follow the rules or make your own? If you are implementing a security awareness program – how do you talk about it with executives? This session will review the top 5 reports that Boards and top executives need to see as you implement a program. They will demonstrate if your plan is working or if changes are needed. These stats about your program will help you plan and secure the gaps between end users and technology while communicating measurable goals. What’s keeping you up at night? Ransomware? Phishing? Spyware? Malware? Data Breaches? A malicious email typically opens the door to those threats. Organizations spend great energy (and budget) preventing users from falling prey, but threat actors continue to find ways to get past automated controls, staying one step ahead of artificial intelligence tools. Cofense believes solving the phishing problem is more than just awareness: it’s about empowering humans to become instinctual nodes on the cyber defense network and feeding their real-time intelligence to security teams for immediate action. Hear from Aaron Higbee and Lenny Liebmann, contributing editor with InformationWeek as they discuss the latest phishing trends, attacks and defense strategies across global enterprises and some predictions of what to expect in 2018. We’re all bombarded by emails. Unfortunately, some are weaponized. They deliver ransomware, other malware, and social engineering scams. What happens when a phishing email gets past your security technologies and lands in employees’ inboxes? This webinar will show you how to teach them to spot and report phishing, feed your incident response teams the intel to mitigate attacks and increase overall enterprise resiliency. Take the first step in creating a collective and collaborative defense. One that enables your team to stop email-based threats. Join (ISC)² EMEA and PhishMe for a look back at 2017’s threats and a look ahead. We’ll provide an overview of what PhishMe's Intelligence team uncovered, discuss trends in phishing-delivered malware, and analyse how various delivery vectors evolved. Cyber-crime won’t slow down. Take this opportunity to learn from the recent past as you deal with current threats and prepare for whatever’s next. Ransomware continues to be a headline grabber but where do these attacks rate compared to other cyberattacks? We look at the history of ransomware, it’s not-so-obvious impacts, and how you can prepare for the next attack in today’s 20/20 webinar. Whether you’re just getting your program off the ground or looking to optimize your current program, this webinar will give you the knowledge you need. It’s based on proven programs involving over 27 million end users across 160 countries. Tune into to find out what others have done to reduce end-user susceptibility by 95% and build resiliency among their workforce. The bad news: phishing is still the #1 cyber-attack vector. The good news: new PhishMe research shows how you can go on the offensive and strengthen your resiliency to costly phishing attacks. Join Lex Robinson, Anti-Phishing / Cyber Security Strategist, as he breaks down data from training simulations and real-life attacks to reveal how you can design a great anti-phishing program. Learn how a proactive approach conditions employees to recognize both active threats—the latest attacks that are costing organizations big-time—and “classic” threats bad actors can recycle whenever they please. See how to gain insights from incident response and phishing intelligence to keep you out in front of evolving threats. You’ll learn how to take the offensive to lower susceptibility, fortify resiliency and disrupt attacks faster. It should come as no surprise to anyone that ransomware has become the hackers’ favored option these days. If you buy in to the scare tactics about ransomware, it’s easy to create, has a high profile in the media and can be lucrative. But like everything else in the data security world, nothing is ever as simple as it seems. This eBook (and corresponding 20/20 webcast) will look at the realities of ransomware, including the real and imagined difficulties of defending against it, the support needed on the attacker’s side to make ransomware effective and tactics victims can take to rid themselves of the malware. Cofense, formerly PhishMe, is the leading provider of human-driven phishing defense solutions worldwide. We deliver a collaborative approach to cybersecurity by enabling organization-wide engagement to active email threats. Our collective defense suite combines best-in class incident response technologies with timely attack intelligence sourced from employees. From driving awareness to security automation and orchestration, our solutions are designed to anticipate and disrupt the attack kill chain at delivery to quickly mitigate the impacts from spear phishing, ransomware, malware, and business email compromise. Today, this is all made real for thousands of global organizations. Learn more at www.cofense.com.